Cook pasta according to package directions and salmon (reserve sauce bag) according to cooking instructions. Prepare a large bowl of ice and cold water. Add pasta immediately after cooking to stop the cooking process. Drain. Add the sesame ginger sauce to a food processor/blender. While running, slowly stream in canola oil to create a dressing. Once salmon has cooled, flake into large pieces. 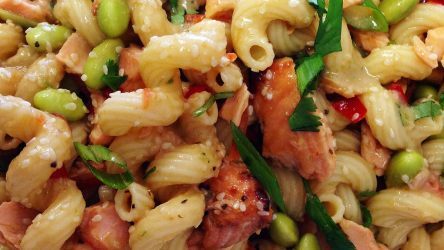 Toss pasta with remaining ingredients and Asian dressing. Season with salt & pepper to taste. Sprinkle with sesame seeds. Serve chilled.